Lavish Lashes is a new and fabulous technique to give you full, longer, curled and thicker looking eyelashes. 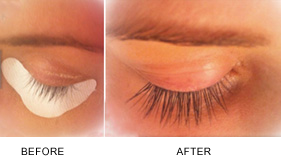 Synthetic eyelashes are applied one at a time to your natural eyelash with a specially formulated bonding agent. This service will make your eyes pop without the worries of mascara. You can choose the size, length, thickness, color or Synthetic Mink lashes are available as well. This is a relaxing treatment that can take up to 2 hours.